Our class will create an inflatable environment for an overnight concert event held in collaboration with the Exploded Ensemble. Members of the Exploded Ensemble plus visiting professional musicians will perform from midnight to 9am April 28-April 29. The environment will be the visual, spatial and textural experience of the evening. It can be one structure, multiple structures, one sculpture, or a collection of sculptures. 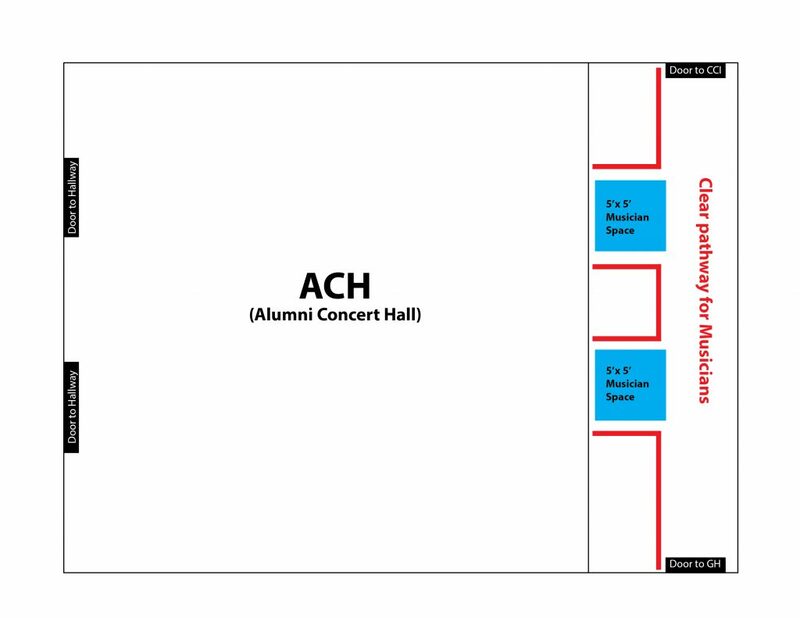 The concert event will take place in the ACH (Alumni Concert Hall) in the CFA Building. Over the next three weeks, your group is to create proposal and mock-up/model of an idea to present to the class. Organized Digital Folder of all drawings, sketches, research, brainstorming, and notes from meetings. Take turns being a note-taker at all of your group meetings. Drawn (by-hand and/or on computer) image(s) of proposed environment. Written description of idea and concept (1-3 paragraphs). Birds-eye-view drawing of where fans, outlets, musicians and environmental elements will be located. First draft of a pattern and estimate of materials needed. Feb. 28 (today) – collect contact info for all members of your group. Schedule a time to meet just before Spring Break. Mar. 5-Mar. 12 – Before Spring Break, meet with your group to share your sketched ideas and brainstorm new ones. Decide on how you want to share and/or distribute the tasks and next steps. Mar. 19 – In-class proposal check-in with Olivia. Mar. 19-25 – Meet again, or multiple times, with group to finalize proposal and elements. Color-changing lights will be used and should be considered. We can use all the ripstop we have already, plus could buy another 100 yards of two different colors. If other materials are also needed, we may be able to purchase those too. What would you like people to see as they are looking up when lying down? How would like people to flow through the space? How will people enter and exit? What is the overall feeling you imagine for the event? Does it change over time? Where will the fans go? What is a minimal sculptural gesture to alter the space? What is a maximal sculptural gesture to alter the space? Come prepared to share your proposals with the class for discussion. Upload your proposals to the class website by due date, March 26.